Britain has long been a pioneer in the fashion industry with a fertile list of innovators. Sophie Taylor takes us on a whirlwind tour of the most inspiring advocates and rebels of British fashion. The Welsh-born Dame is best known for her daring miniskirts, hot pants and total disregard for the fashion industry’s strict ethos, succeeding without financial backing. Mary Quant premiered her Chelsea beatnik inspired designs in her boutique, Bazaar on the Kings Road at a time when fashion wasn’t targeted to the younger generations, in 1955. And boy, does she have a lot to answer for. Not just within the mod revival movement, but those mini a-line tunics, patterned tights and geometric monochrome designs can be seen on the high street even now. Jean Muir shunned the fashion industry’s fast market and short attention span. Beginning her career as a fashion sketcher for Liberty’s in 1950, Muir started designing for Jaeger before establishing her own firm Jane and Jane in 1961. She won many awards for her designs but preferred to be called a dressmaker. Her clothes were targeted towards a more mature audience and favoured classic elegance over contemporary trends and fads. She wanted the wearer to make the statement, not the clothes and was known for simple flowing lines and skilled tailoring in plain, dark colours. Joanna Lumley was one of her biggest fans, becoming a friend and muse to Muir, frequently modelling her dresses. 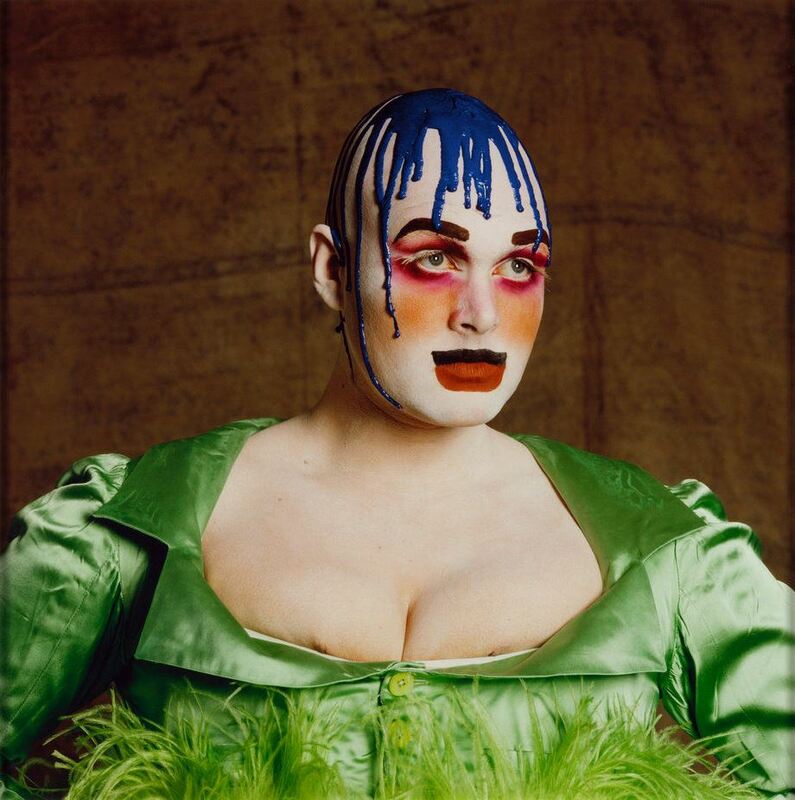 Performance artist, fashion designer, pianist, actor and even model for painter Lucien Freud, Leigh Bowery is a multi-faceted tour de force. Although Australian born, Bowery identifies more with Britain as he felt accepted in London, away from the conservative surroundings of his youth. He would design costumes for his two friends and flatmates to wear to the clubs, and they were eventually known as The Three Kings. They would wear beautifully garish make-up, ostentatious wigs and headgear: creations with no particular set style or influence but made with wild abandon and performative capacities. Bowery later opened his own club aptly named Taboo, which defied sexual convention and celebrated alternative, flamboyant dress. His life and costume-like designs influenced the likes of Vivienne Westwood and Alexander McQueen, post-humously inspiring the creation of West End musical Taboo performed by Boy George. And so to Dame Viv. The queen of Punk has always been a rebel, using the runway as a soapbox for her views on politics from Thatcher to Wikileaks. This desire to not conform is at the heart of her designs that take traditionalist styles and play with them in subversive ways: sticking safety pins in Harris tweed, making rips in tartan, re-purposing the corset. With Malcolm McLaren, Westwood pioneered the punk movement through her clothes. Using the badges, leather and chains of the bikers and the straps and buckles of fetishists they reappropriated 1950s pin up clothing. Although expensive to buy as originals, the design could be easily improvised by the punks themselves which quickly spread the aesthetic until ending up in the mainstream. Westwood has now turned her attentions to changing the establishment from within. 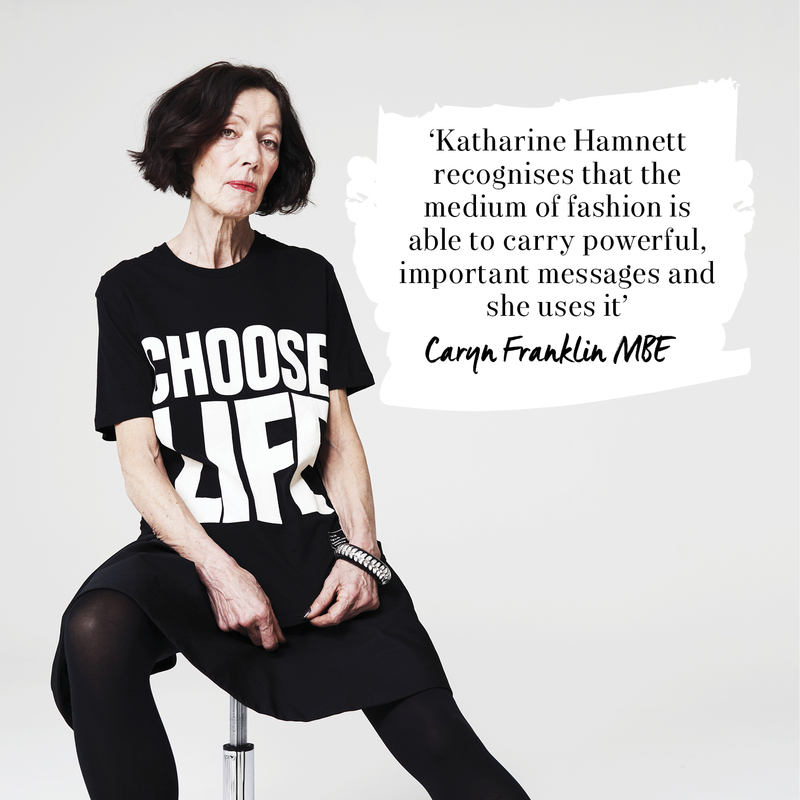 Kent-born designer, Katharine Hamnett, is best known for her political slogan tee shirts and ethical business philosophy. Launched in 1983, the Hamnett oversized tee shirts, bearing nothing but politically charged statements in bold type, captured the world’s imagination with imitations still seen on today’s high street. This copycat culture was all part of Hamnett’s initial plan, saying she wanted the designs to be ‘ripped off’, particularly after being worn in pop videos and reaching mass audiences. From 1989 the designer has lobbied against sweatshop labour, campaigning for major changes in the industry’s operations and has showcased her commitment to the anti-nuclear cause with slogans like ‘NHS NOT TRIDENT’ in 2013. Named the ‘hooligan of fashion’, London-born McQueen lived up to his nickname with a controversial and varied career. While working as a tailor on Savile Row, Lee McQueen sent up the establishment by chalking obscenities into the lining of a blazer for the Prince of Wales. It seems ironic that McQueen’s successor then went on to make Kate Middleton’s dress for the Royal wedding. Iconic stylist Isabella Blow discovered McQueen whilst he studied at Central Saint Martins, appreciating his delicate and exquisite tailoring and designs before he began work as chief designer at Givenchy. He then went on to launch his own line in 2001 with the ethos that ‘fashion should be a form of escapism and not a form of imprisonment’.